3-D Model of Shroud of Turin: Does this help prove or disprove the Shroud was used by Jesus? Italian researchers and experts have revealed that they have new and fascinating answers to how Jesus looked as a human man. Based on this replica, Jesus is thought to have been taller than the average man from the first century. “According to our studies, Jesus was a man of extraordinary beauty. Long-limbed, but very robust, he was nearly 5 ft. 11 in. tall, whereas the average height at the time was around 5 ft. 5 in. And he had a regal and majestic expression,” said Fanti. The University of Padua and Padua Hospital collaborated to create the life-sized replica of Jesus, which can be seen in the video below. This is NOT real Christian news as the Shroud is NOT possibly the burial cloth of Jesus. I will not bother to list their reasons as to why they claim that the Shroud of Turin is “the real deal,” because it cannot be. While WND sometimes has useful information, pushing this shroud nonsense is absurd. There is no way that the Shroud of Turin represents Jesus. Even the Church of Rome will not say it is the real deal (but it teaches that it is fine to idolize/venerate it). In the past couple of years, I have seen comments from some Protestant leaders who seem to believe Jesus used this shroud. WND is also a Protestant source, and really should not be promoting icons like this. The Gospel writers say that the body of Jesus, after being taken from the stake by Joseph of Arimathea, was wrapped in clean fine linen. (Matthew 27:57-61; Mark 15:42-47; Luke 23:50-56) The apostle John adds: Nicodemus also came bringing a roll of myrrh and aloes, about a hundred pounds of it. So they took the body of Jesus and bound it up with bandages with the spices, just the way the Jews have the custom of preparing for burial. John 19:39-42…writers of the third and fourth centuries, many of whom wrote about a host of miracles in connection with numerous relics, did not mention the existence of a shroud containing the image of Jesus. What happened to it at this time, if it did exist, is unknown. Basically, strips of linen were placed on Jesus’ body somewhat like a mummy (this is also basically what happened to Lazarus, see John 11:43-44). If the Shroud of Turin was saturated with myrrh and aloes, it would by now be fairly stiff and would tend to look quite different than it now does. 6 Then Simon Peter came, following him, and went into the tomb; and he saw the linen cloths lying there, 7 and the handkerchief that had been around His head, not lying with the linen cloths, but folded together in a place by itself. 8 Then the other disciple, who came to the tomb first, went in also; and he saw and believed. 9 For as yet they did not know the Scripture, that He must rise again from the dead. 10 Then the disciples went away again to their own homes. (John 20:6-10). By the time the Apostle John wrote this, if there had been any real special powers associated with the shroud, it would have seemed that he would have mentioned them, but he did not. “I am convinced that this is the shroud that covered Jesus Christ after His crucifixion.” So declared Dr. Max Frei of the University of Zurich after painstakingly testing for pollen grains in the linen of the shroud and analyzing them. “My analysis of pollen grains has been confirmed under the electron microscope beyond any reasonable doubt…. I isolated from the shroud more than a dozen pollen grains from plants growing in Jerusalem and surrounding deserts. They grow only in the Near East,” he said. “The pollen most found on the shroud is identical to the most common pollen in the sediment of Lake Tiberias, in Israel” (National Enquirer, Nov. 29, 1977). But even if we accept that the pollen proves the shroud once resided in Palestine, it would not necessarily connect it with Christ, for Dr. Frei also found in its fibers pollen from the area of southeastern Turkey! This finding would, perhaps, support Ian Wilson’s theory that the shroud itself is none other than the famous Mandylion (meaning “napkin” or “handkerchief’ in Arabic) which had been brought to Constantinople from Edessa in eastern Turkey. From there he postulates the Knights Templars took the shroud to the Holy Land before bringing it to France. Fifty years before the shroud enters history in the possession of Geoffrey deCharnay and the Lirey church, there was another Geoffrey deCharnay. This other Geoffrey is not provably related, but shroudists suspect that he was. This man was a famous knight of the Templar organization, which King Philip the Fair of France charged with secret “idol” worship of a disembodied head — the image on the shroud, says Wilson and Geoffrey was martyred, all the while denying there was any idol. The Templars had sacked Constantinople (Byzantium) in 1204, which, as capital of the Byzantine Empire and center of its religion, had become glutted with relics and icons innumerable. Among the relics, according to extant records, was something called a burial cloth of Christ, which apparently bore a full length image, and also the famous Edessa image, the Mandylion, which had been taken by force from the Moslem rulers of its city in A.D. 944. These both disappeared in the looting — possibly taken to the Templars’ Palestine headquarters. Ian Wilson speculates that both cloths were one and the same. He explains the double listing as possibly referring to copies of the original. A flourishing industry existed in Byzantium of making cloth and other images of “Christ.” Many of these were, like the Mandylion itself, regarded as miraculously produced. 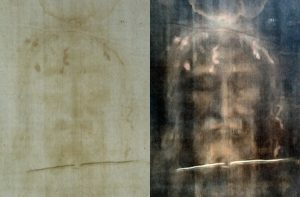 The problem for Wilson’s theory is that the Edessa image is specifically described as a face only, appearing on a towel, a veronica napkin, while on the Turin shroud is undeniably a double full length figure. Wilson suggests the reason was that the shroud had always been kept folded in such a way that only the face was showing. In any event, the image on the shroud has a long, sad face and long hair. A writer for the London Tablet was moved to observe: “The first thought likely to occur is: But how very strongly the figure resembles the Christ of any number of old masters [painters of the fifth century on]”‘ (quoted from Wilcox, p. 26). There is more to that statement than meets the eye. The oldest pictures of Christ are paintings on the walls of the catacombs of Rome. Most date from the second and third centuries. It was against the teachings of the church to have such pictures (see box: The Early Church and Images). Nevertheless, those who sketched them only about 100 years after the apostles — were undoubtedly acquainted with individuals who were familiar with the general appearance of Christ that came by word of mouth from His own generation. “… There is a painting of the Resurrection of Lazarus in which Christ is shown — youthful and beardless, with short hair and large eyes…. 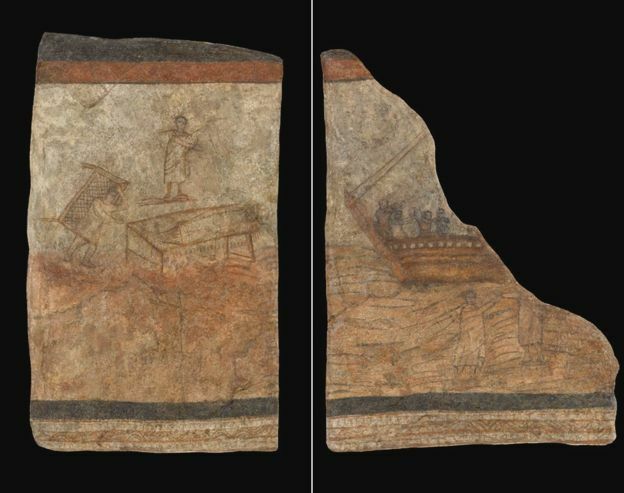 Although it is now only barely recognizable, this picture is of great interest since it is the oldest representation of Jesus that is preserved anywhere” (Roderic Dunkerley, Beyond the Gospels, p. 57). How Was Christ’s Body Really Wrapped? The shroud theory demands that Christ’s body was covered differently than was the custom in Jewish burial. The usual fashion was for the body to be wrapped cocoon-wise in strips of linen cloth which were bound at hands and feet. All representations of Christ’s burial in the first four centuries assumed this Egyptian-like style. “The [Jewish] corpse was wrapped in a shroud, and bandages soaked with resin were wound around the hands and feet: a cloth, the sudarium, was placed over the face (John 11:44). Finally the tomb was shut” (Bo Reicke, The New Testament Era, p. 187). The account of the raising of Lazarus illustrates the method. “The dead man came out, his hands and feet bound with bandages, and his face wrapped with a cloth.” It would appear that he was so enclosed and tied as to be scarcely able to walk until “Jesus said to them, `Unbind him, and let him go”‘ (John 11:44). Shroud of Turin theorists postulate that Joseph of Arimathea, not having time to bury Christ’s body properly, simply covered it, leaving the body lying amidst the rolls of cloth he had brought for the usual wrapping, perhaps intending to return and use them after the Sabbath. They suppose this may have been what Peter saw when he came into the tomb after the resurrection and saw “linen cloths lying, and the napkin, which had been on his head… rolled up in a place by itself (John 20:6-7). But Matthew tells us that “Joseph took the body, and wrapped it in a clean linen shroud” (Matt. 27:59). This shroud was obviously not merely a long flat cloth like the Turin shroud, laid out under the body, then folded over it from the head. Jesus is not shown to have long hair or a long beard. Everyone knows what Jesus looks like. He is the most painted figure in all of Western art, recognised everywhere as having long hair and a beard, a long robe with long sleeves (often white) and a mantle (often blue). Jesus is so familiar that he can be recognised on pancakes or pieces of toast. But did he really look like this? In fact this familiar image of Jesus actually comes from the Byzantine era, from the 4th Century onwards, and Byzantine representations of Jesus were symbolic – they were all about meaning, not historical accuracy. From the above, we can also conclude that when we have reports of people who claim to have seen Jesus in various ways, those who claimed He had long hair, etc., clearly were not seeing Jesus. The same can be said of the Shroud of Turin–that could not possibly be Jesus. It is a version of the pagan deity Zeus that many people are bowing down before or otherwise venerating (perhaps it should also be added here that many of the portrayals of Jesus’ mother Mary, came from worship of goddesses, like Diana, who the Greeks called Artemis). While the BBC article used the expression “probably not” related to whether Jesus had long hair, the biblical answer is DEFINITELY NOT. If Jesus had long hair, God would have not inspired John to say to walk as Jesus walked, while also inspiring Paul to write that it is a shame for a man to have long hair. No early Christian ever showed Jesus as a long haired person. Having short hair was normal. The earliest found depictions of Jesus do NOT show Jesus to have had long hair. While no one knew, even then, what Jesus actually looked like, it took another century (and likely the influence of the idolatrous Emperor Constantine) before the longed-hair portrayals began to appear en mass. Furthermore, if Jesus had distinctively long hair, He would have been highly recognizable. But the Bible shows that He was not. Once, while He was speaking to the Jews during the day, they wanted to stone Him, but He escaped right after talking to them (John 10:31-39), which indicates He was not excessively tall (like the Shroud of Turin suggests) or had distinguishing features like long hair. Furthermore, the Jewish leaders felt the need to pay Judas (Mark 14:10) to point out Jesus with a kiss so they could arrest Him (Mark 14:43-46), which they would not have needed to do if He was distinguished with features like long hair. If he had had even slightly long hair, we would expect some reaction. Jewish men who had unkempt beards and were slightly long-haired were immediately identifiable as men who had taken a Nazirite vow. This meant they would dedicate themselves to God for a period of time, not drink wine or cut their hair – and at the end of this period they would shave their heads in a special ceremony in the temple in Jerusalem (as described in Acts chapter 21, verse 24). While some claim that Jesus never made nor drank wine, but only grape juice, consuming anything from grapes was prohibited for Nazirites. Since Jesus did not sin, He certainly was not under a Nazirite vow walking around with long hair while at the same time drinking anything produced from grapes . Sadly, many prefer to accept the Byzantine portrayal of Jesus as Zeus. People are not honoring Jesus by venerating long haired portrayals of Him that came from paganism. Furthermore, even if the actual burial cloth of Jesus was the Shroud of Turin or some other similar relic, it should not be venerated by Christians. History records that the early Christians opposed venerating relics. Many do not seem to realize how negatively early Christians viewed such items. The Continuing Church of God does not consider that the Shroud of Turin is holy nor is possibly the burial cloth of Jesus. Among other reasons, it is not supported by the historical record nor scripture. The image on the Shroud of Turin shows a long-haired male. Yet, Jesus did not have long hair. While hair does grow after death, it does not grow quickly enough for the length that is on the Shroud of Turin. Jesus said He would be in the grave three days and three nights (Matthew 12:40), and that would not be enough time for long hair to appear. That image is too big too have been Jesus of the Bible. This means that the Shroud of Turin is 174 inches, 14.5 feet, long. The height of the man in the shroud would need to be about 6 ft. tall. That could not be Jesus. Jesus did not stick out in a crowd (cf. Luke 4:28-29), and even needed someone to identify Him (Matthew 26:48). Men were much shorter then than now and a six foot man would be noticed. If the shroud was that of Jesus, Jesus would have had to be tall to blend into the crowds at that time. There is no reason to believe Jesus was tall or had any special appearance–the Bible indicates the opposite (cf. Isaiah 53:2). Most do not know a lot about the Bible and know even less about early church history–and what many think they know is clouded by misinformation and misconceptions. And the Shroud of Turin does not provide helpful information into original Christianity, it only seems to be for those who prefer icons and improper traditions of men over what the Bible teaches. People claiming to be Christians should not promote it as a relic of Jesus! UPDATE 04/08/18: We just made a related video: Could the Shroud of Turin Be Real? 12 Reasons to Consider. Clear Proof that the Shroud of Turin is Fake: Debunking the ‘reasons’ that the Shroud of Turin is real There is NO proof that the Shroud of Turin has Jesus’ image and those who are willing to believe the Bible can prove it is fake. Here is a link to a related video: Could the Shroud of Turin Be Real? 12 Reasons to Consider. What Did the Early Church Teach About Idols and Icons? Did the early Church use icons? What was the position of Christians about such things? A related sermon is available: The Second Commandment, Idols, and Icons. Where is the True Christian Church Today? This free online pdf booklet answers that question and includes 18 proofs, clues, and signs to identify the true vs. false Christian church. Plus 7 proofs, clues, and signs to help identify Laodicean churches. A related sermon is also available: Where is the True Christian Church? Here is a link to the booklet in the Spanish language: ¿Dónde está la verdadera Iglesia cristiana de hoy? Here is a link in the German language: WO IST DIE WAHRE CHRISTLICHE KIRCHE HEUTE? The Churches of Revelation 2 & 3 Do they matter? Most say they must, but act like they do not. This article contains some history about the Church of God (sometimes referred to as the continuation of Primitive Christianity) over the past 2000 years. This entry was posted on Thursday, April 5th, 2018 at 3:00 pm	and is filed under Religious News. Could the Shroud of Turin really have been used by Jesus? Is the ‘Shroud of Turin’ really Jesus’ burial cloth? Could the Shroud of Turin be Jesus’ burial cloth?